Assassin’s Creed Odyssey is a tough game to quantify. On one hand it’s a stupidly huge, idiotically beautiful open world game that is a blast to explore. On the other hand, it has the same Ubisoft checklist-style game design ingrained into that world. And on my protruding Kuato-like growth’s hands it is one of the most memorable and fascinating Assassin’s Creed games in large part thanks to an RPG-like dialogue choices and quest paths, but most of its narrative and RPG elements feel frustratingly limited. I can say one thing: I like it. A lot. If you wanted you could just take those words above as a review and go play the game for yourself. It’s a good game! You should play it! That’s my recommendation. But also it’s one of those games that I think is a bit messy in its execution. I’m hoping that by writing a long meandering post about the good and the bad of the game I’ll be able to explain what I mean by that. Don’t worry, I’ll try to make it entertaining! OK first off, Ancient Greece? More like Ancient Beast- the game is huge! The starting island of Kefalonia alone is probably as big enough to pass as a whole map in an older Assassin’s Creed game. I scoured that island for literal hours uncovering every secret, finding every location, and completing every side quest before even triggering the title card for the game. “Aw heck,” I said to myself, “If this is just the tutorial area, I’m never going to finish this game!” This is only half true. I “completed” the main questlines after putting in several dozens of hours into the game. I picked up the game on launch day and only now beat the main story campaign a month later. To put that into perspective, I was able to complete the bulk of Spider-Man’s story and side missions in one long weekend. Assassin’s Creed Odyssey is just that leviathan. Like most mortals, I am a person of limited time. Simply being a big, long game is not a good selling point for me. It’s like asking me if I’d want to grab lunch at a Pizza Hut buffet or go to an Italian joint. Nine times out of ten, I’ll take the Italian joint. Assassin’s Creed Odyssey is an Italian restaurant with unlimited soup, salad, and breadsticks. Assassin’s Creed Odyssey is so huge that I don’t think that a normal human person would be able to see everything the game had to offer. And for this type of game, that design works in it’s favor! The game takes place before 600BC at a time when myth and legend was as real as the Geocentric model of the universe. When you run across sunken ruins of the temple to Poseidon, the giant tree dubbed “the Club of Heracles”, or a cave called “The Entrance to the Underworld”, you think “oh geeze, maybe this stuff is real.” The world feels big and imposing and it works because the world is supposed to feel big and imposing. The game is supposed to be this big sprawling adventure where you explore around and forge your own path. It’s an epic explore-a-thon that reminds me more of The Legend of Zelda: Breath of the Wild or The Elder Scrolls V: Skyrim than past Assassin’s Creed games. But it is still an Assassin’s Creed game. Ubisoft design dictates that gamers need hashtag Content™ and must therefore have a literal checklist of things to do. Odyssey is no different. Each location (a number of different question marks scattered across your map) has a set number of objectives that pop up when you get close to them. It’s handy if you are the completionist sort, but after a while it kind of removes a lot of the mystery and decision-making from the game. Around the fifth military camp you kind of sigh as you murderize all the captains and burn their war supplies. And are you really gonna be the guy who only finds two out of three treasure chests in a bandit cave? Gotta get that loot, son! And just a quick aside, I’m not a big fan of the loot system. There is so much loot in this game that it’s somewhere between bonkers and bananas. You get loot from everything. Chests, quests, dead people. I found myself opening and clearing out my inventory nearly every 30 minutes because of how much loot you get just by doing stuff. And by the time you’re max level in the game, anything less than the pre-rolled legendary gear is just eating up inventory space. I reached the level cap about halfway through the main campaign and I suspect a normal sane person would reach it around three-quarters of the way through. Why so much loot? This ain’t Destiny, bro! Another aside, the whole experience point booster controversy was a total non-controversy, like, I dunno, man, do some side quests or actually play the game or something instead of rushing to the next quest marker. If you’re like me a don’t want to rush off to quest markers, then Exploration Mode helps get rid of some of that rigid Ubisoft edge. It turns off the bulk of the map markers and leaves you to interpret cryptic directional clues such as “go north” or “look for the statue on the path to town.” It’s great! It’s far more engaging than simply following a waypoint to the next quest step and forces you to engage the game world as a real place. It helps the whole epic adventure feel of the game. But after a while you kind of catch on that most of those hints are pretty easy to suss out on the map scree; you just take the directions an put your own custom waypoint on the nearest “?” that fits the description. Still! It’s a step forward. I still think I would have preferred a completely marker-less, checklist-less aproach like in the Breath of the Wild or Skyrim with an Immersive HUD mod installed. Those games are like friends who say “Hey, you wanna do this thing? If you don’t that’s fine if you don’t. I mean, whatever. We can do want you want to do.” Those games are great at not caring about stuff you want to skip, they’re here for you, man. Assassin’s Creed Odyssey is the friend that sometimes peer-pressures you into watching The Amazing Spider-Man opening night at the theater even though you’re not totally into watching it, don’t care much for crowded rooms full of people you don’t know, and don’t like staying up late. I did that once. I went to see The Amazing Spider-Man opening night and then a cop pulled me over on the drive home because he thought I was on drugs because my eyes were shot from a lack of sleep. The cop also thought brother’s root beer was actual beer. My point is this: If you’re going to make a game about exploration you have to accept that not everyone is going to see everything in the game while active encouraging your players to seek out new locals on their own. You’ll have to trust that your players will want to seek out these cool places you built and will open every chest and kill every dude because you put a marker on their map or an objective pop-up on the bottom left of their screen. When you aren’t aimlessly wandering the Greek countryside, you’ll be taking quests from local nobodies and famous history people. These are easily the best parts of the game. Most of the quests have you doing the regular find, kill, loot formulas but they have a little extra dramatic flair. A quest might send you off to fight mythical beasts or root out a mob boss. One quest sends you to fix the Olympic games. The best quests go off the beaten path and have you do things like improvise a war song, tell a group of kids the legend of Percicles, or fight a fake tourist-trap Minotaur after you’ve already killed the real Minotaur. Heck, there’s even a questline that’s basically a battle royale mode! Those are in everything these days, so it’s got to be good, right? Not every sidequest is a hit, but at the very least they’re interesting distractions meant to help send you out into the larger Greek world. At their best, they are some of the most enjoyable sequences I’ve ever played in an Assassin’s Creed game. The main story itself is also the most engaging story I’ve experienced in the Assassin’s Creed series. That’s mostly thanks to Kassandra (lol who’s Alexios?) being a total badass. She’s the type of epic hero who can fight a full garrison of soldiers, crew a ship with all of her lovers, and then sit down and have a drink with someone with a friend who used to try and kill her. Kotaku’s own Nathan Grayson who called Assassin’s Creed Odyssey “the best Wonder Woman game ever made.” Kassandra is that good and I love her. Most of her story involves running around the world trying to get her family back together after they were torn apart while rooting out an evil cult that wants to take over the world. Naturally historical figures show up too and there’s some conspiracy-theory intrigue happens. Assassins Creed Odyssey also leans heavily into the weird sci-fi fantasy themes other Assassin’s Creed games hint at but never fully embrace. Assassin’t Creed Odyssey goes all in with that weirdness and it is so much better for it. The game’s story also has a lot more focus on narrative choice than past Assassin’s Creed games. These usually play out in BioWare-style choices and conversation branches. Usually this just means you can shape Kassandra so that she is a kind-hearted mercenary with a heart of gold, a super-aggro warrior, a boastful demigod, or horny on main. There’s romance options in this game! And multiple endings to quests! It’s neat! But it’s also kind of inconsistent in it’s choices and presentation. Romance options are nice, but they tend to be short affairs that are forgotten as a plot point almost immediately. (It kind of reminds me of older action shows like MacGyver or Magnum P.I. where the main dude would have a new romantic interest nearly every other episode. I uh...really don’t mind that approach? It’s kind of cool seeing that trope gender-flipped with Kassandra?) Most quests go by pretty smoothly and offer fun little mini-sagas to get lost in for an hour or so. Others are...ok so there’s this part of the game where you help a rebel leader help liberate an island from Athenian rule. She is backed by a Spartan commander who is implied to be her lover, though it doesn’t sound like an official relationship. One thing leads to another and Kassandra ends up having a secret romantic relationship with the woman. After the island is freed, the Spartan commander finds out and challenges Kassandra to a duel to the death for his honor. Assassin’s Creed Odyssey’s stories have small aggravations like that from time to time. Sometimes it feels like the quest-makers just didn’t think that want to do something differently, sometimes it feels like Ubisoft bumbling the narrative. (Remember when Ubisoft hired an actual cult expert to consult on Far Cry 5 and they didn’t listen to her at all? Or that time they said The Division 2, a paramilitary sleeper agent sim set in Washington DC, wasn’t political?) Like, the phrase “make Athens great again” is hamfistedly shouted to a cheering, rabid mob. Rock, Paper, Shotgun has a good article explaining how the slave-trade in ancient Greece is sheepishly presented in the game without much context or nuance, hashing out some takes that some pretty dang insidious and terrible people use to excuse American slavery. Heck, one major quest kills off a pair of female romantic partners on the isle of Lesbos while reciting the words of the poet Sappho. Assassin’s Creed Odyssey buries its gays deep. And yet -and yet!- despite that the game delivers more than it doesn’t. Tracking down and assassinating evil cultists reminds me of the first Assassin’s Creed. The family-centered justice/revenge plot with a charismatic main character reminds me of playing Assassin’s Creed II. The Season Pass that includes a remaster of Assassin’s Creed III reminds me that Assassin’s Creed III exists. The naval battles and exploration reminds of Assassin’s Creed IV: Black Flag. The tension of the mercenary system -where other mercenaries can be hired to hunt you down if you become too much of a nuisance- reminds me of Assassin’s Creed Rogue. The leveling and quest structure reminds me of Assassin’s Creed Origins. 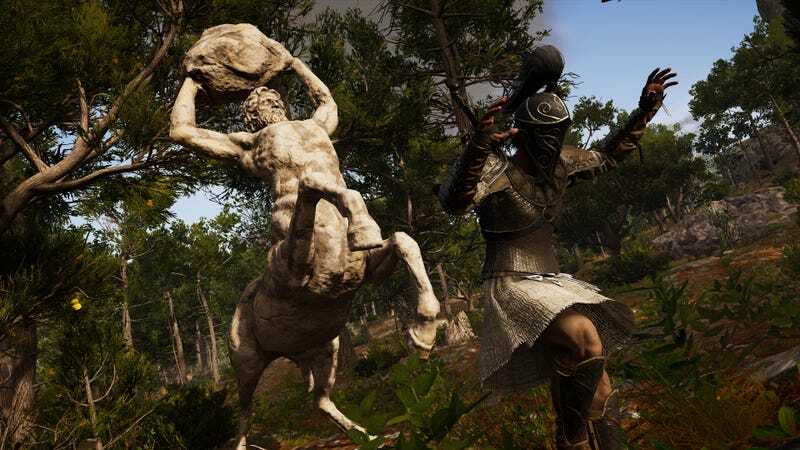 Assassin’s Creed Odyssey absorbed all of those games and memories and grafted them into something better like some weird chimera. Zachary Long occasionally writes on TAY and can be found on Twitter, Stem, PSN, and pretty much everywhere else as InvadingDuck. Currently playing: Assassin’s Creed Odyssey, Yakuza Zero, Hollow Knight, and Dragon Quest XI.